Here we have our Mazda Bongo 4 berth. It has 2 burner hob and a sink with water tank and a fridge with small freeze compartment. Electric Pop top roof which gives extra height and sleeping space for 2 as well fold down seats sleeping space for another 2. The van has a lesuire battery and electric hook up so no need to worry about running the battery down when listening to the radio or using the lights, or charging your phone. 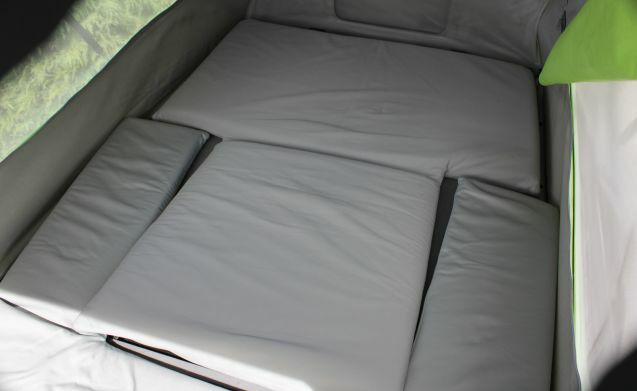 - Bedding: - Sleeping bags, pillows and blankets. The van has 4x electric side blinds and 4 other blinds to give complete darkness. There is a Diesel heater for those cold nights. - Kitchen:- Cutlery, Plates, bowls, mugs, tumblers, pots, pans and cooking utensils, can opener, kitchen knives, chopping board and frying pan. - Outdoor picnic bench with seating for 4. We can also supply baby/child seats for all ages (small charge appplies. We hope it’s just a case of "turn up and go". If there is anything you need not listed let me know in advance and we will get it sorted for you. Unlimited mileage available free of charge on all rentals of 2 weeks or more.